I cannot tell you the last time that I was at the St. Louis Science Center on a Saturday, so experiencing that craziness on top of the Bright Ideas Expo was enough to make me exhausted by day's end. Here is a photo of my display as taken before the event started. All in all, it was an experience. Setup went smoothly, and tear down equally as such. The bits in between were a blur; but in the best way. Six hours flew by and with the help of hundreds of little hands choosing what fabric I should use next, I was able to piece 24 blocks. Some of which will need some additional pieces added to them; but overall most are at least 12 1/2" x 12 1/2" wide. While I was prepared to "talk about quilting", most of my conversations were showing how a sewing machine worked, as most of the kids attending had not seen one live and in person. There were a few surprises though, including one visitor who actually read my blog and came out to say Hi [that was pretty cool} and a few people who knew what modern quilting was right off the bat. 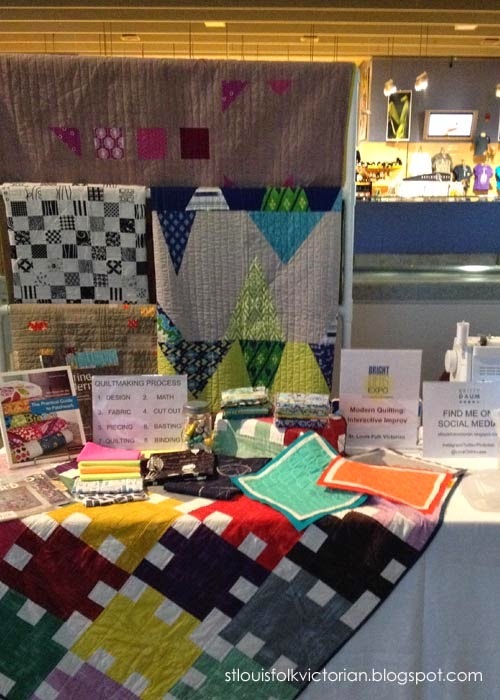 All in all, I was happy that I could represent Quilting and show that this art form is anything but extinct. 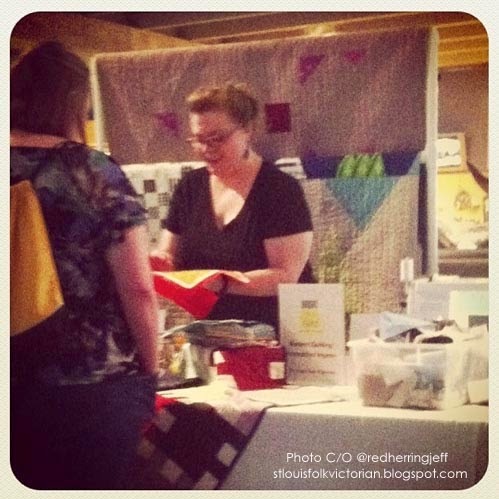 Photo courtesy of Jeff, another Bright Ideas exhibitor. This concludes my posts on the Bright Ideas Expo, the first of many events I have been invited to attend at the St. Louis Science Center this year. 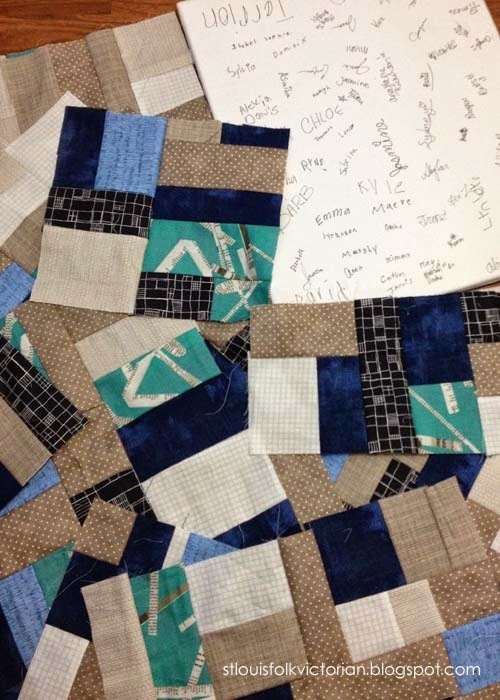 It's been interesting reading about this over the last while, will you share a photo of the finished quilt? Look, there's my name! :) Can't wait to see the finished quilt. Thanks for the recap! Fun! Love the elevation pattern...wonderful selection of fabric!